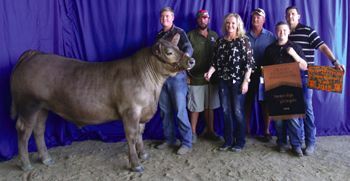 CROSBY  On the books is a success story that is mostly owed to the selfless dedication of a group of Crosby families that make possible the Crosby Fair & Rodeo. This year the 4-H Livestock Auction brought in a record over $303, 000 even as at press time the tally was being counted. Certi-Fab Industries again paid $15, 000 for the Grand Champion Steer this year to Colton Hoehner. The Pink Heals was awarded $150, 000 from the Tough Enough to Wear Heals Committee and the American Cancer Society was awarded $10, 000 to fight cancer nationwide. Pink Heals helps those battling cancer with paying bills and necessities locally while they fight cancer. Top Rodeo Hands, a recognition for most helpful youth to the Crosby fair & Rodeo went to Darion Klise as Senior and the junior catagory went to Blake Larkin. Bob Ward received an award that his group Eastside Veterans started a few years ago. The Citizens Recognition Award goes to the person most outgoing in community involvement. Last years winner John Lindsey, of the Crosby ISD Board of Trustees, awarded Ward the plaque. Saturday night the audience packed the rodeo and the concerts by Hill Country Jane and Kevin Fowler brought even more inside the Rockin C.
HUFFMAN  A Crosby woman shot a man with a knife that demanded her purse and money at the Exxon Station near Saddle Creek Subdivision on Friday, June 5. According to Harris County Sheriffs Deputies, Casey Price, 43, pulled his old GMAC truck up next to a relatively new Toyota Truck then entered that truck that belonged to a local woman as she was checking her e-mails on her phone while fueling her truck. She pulled a pistol and discharged it three times at point blank range. Casey Price was struck once in the shoulder and once in the side. according to Deputy Thomas Gilliland for the Sheriffs office. Reports say he turned and ran the two steps toward his truck. The woman exited her truck prepared to fire again if the situation escalated, the suspect seeing her exit turned and ran north on FM 2100. When he had run over 1/4 mile, he collapsed in front of the Sierra Madre intersection. About this time a deputy had caught up with him. He had lost a lot of blood and Harris County ESD#5, the ambulance service for Crosby rolled up at about the same time as the deputy. He is facing charges of aggrieved robbery with a deadly weapon. Proper training for a Concealed Carry License appears to have been the distinction between this case and others. She would have reacted as she was trained to a criminal situation involving weapons. Some ask if the defendant had learned his lesson. The heavy rains that fell on Memorial Day evening, and continued the rest of the week, flooded low areas along the San Jacinto River in Banana Bend and Rio Villa, and other neighborhoods and streets. In a 24 hour period, West Houston got 11 of rain, North Houston 5 and the Highlands/Baytown area about 9 according to the National Weather Service. Some residents were comparing it to the devastating flood from Tropical Storm Allison in 2001, but that storm dumped 35 while this weeks storm only had rainfall of about 20 for a 5 day total. Harris County OEM reported about 531 high water rescues throughout the metropolitan area. 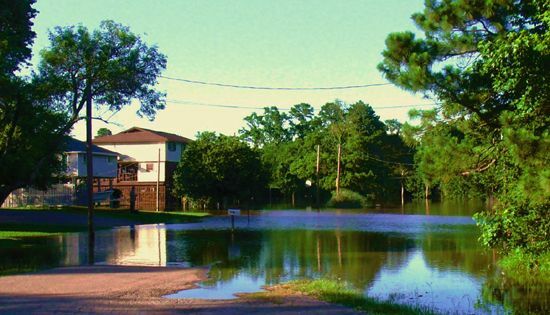 The Harris County Office of Emergency Management issued a Warning on Wednesday, May 27 to all Residents Below Lake Houston that street flooding could cut off access for Neighborhoods near the river, for as much as 6 days. They listed a number of websites to help residents.